With production facilities in Belgium and the U.S., Godiva Chocolatier is recognized around the world as the leader in fine chocolates. Through its prototype, Godiva reinforces its European heritage and a sense of prestige, seeking to build on this area of customer appreciation and a celebration of product and experience. 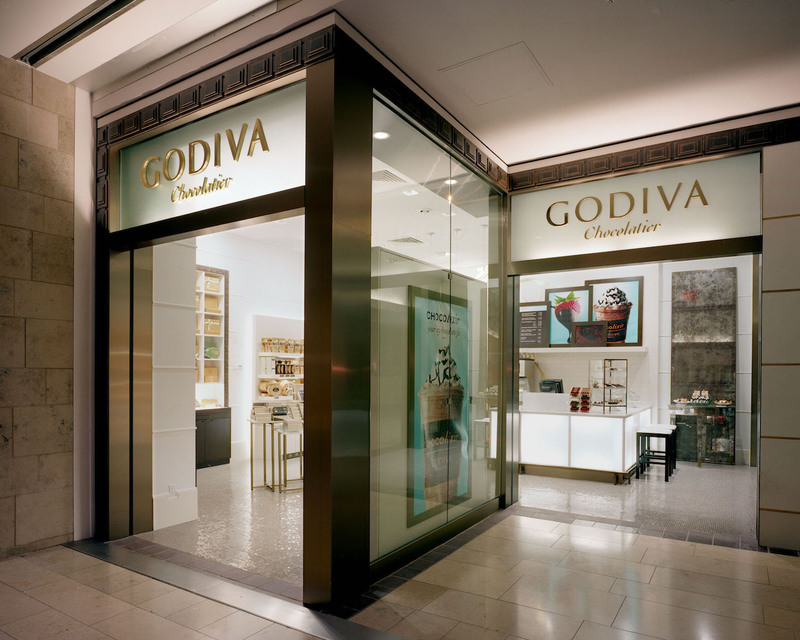 While making the brand and products more accessible, Godiva remains special as a unique self-indulgence, social medium, and thoughtful gift to others or one’s self, both at and outside of major holidays. Through a more approachable, inviting environment, the sights and smells of the global chocolate brand beckon consumers inside to partake in a luxuriously indulgent experience. The store incorporates a sensual art nouveau architectural style, taking cues from mosaic and bond patterned tiles, horizontal stripes and borders. Visible from the exterior, the “theater” of the store experience is the dipping and beverage bar, where confections, cookies and fruits are finished-before-your-eyes with the distinctive Belgian chocolate.